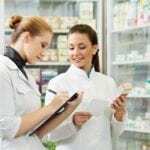 Changes to the role of the licensed pharmacist place additional responsibilities on pharmacy technicians who perform much of the duties of pharmacists. In today’s pharmacies, technicians receive and fill prescriptions, maintain stock, order supplies, and manage administration. However, a pharmacist must check the technician’s preparation before medication is dispensed to ensure the right medication gets to the right patient. National certification through the PTCB is becoming the standard for employment within Maryland and other states. Employers want competent and well-trained professionals who can practice within the competencies outlined by the Maryland Board of Pharmacy. The state requires all practicing technicians to register with the MBP. 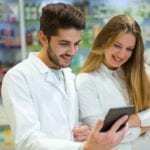 As the clinical role of pharmacists expands and the aging population increases the workload on community and institutional pharmacists, employment opportunities for pharmacy technicians will grow. PTs work in hospital pharmacists, long-term care facilities, community pharmacies, mail-order pharmacies, and non-traditional settings, such as pharmaceutical companies, medical insurance offices, and whole companies. The pharmacy technician program at Howard Community College meets the Maryland Board of Pharmacy regulations for technicians and may be completed in less than one year. The program is open for admission in the fall and spring semesters each year. Graduates are eligible to sit the PTCB exam and application for registration with the Maryland Board of Pharmacy. The curriculum covers 256 hours of instruction: 96 theory hours and 160 externship hours. Classroom instruction covers measurement systems, reading and interpreting prescriptions, drug classes and uses, controlled substances, generic and brand name drugs, billing and reimbursement, pharmacy law, quality assurance, medical terminology, pharmacy calculations and conversions, inventory control, and pharmacy law. Classes meet Tuesdays and Thursdays from 6:30 pm to 9:45 pm. The pharmacy externship takes place at local partnership sites, such as CVS, Vistascript, and Walgreens. Students meet 20 to 25 hours per week. Participation in the pharmacy externship is dependent upon the results of a criminal background check and drug test. Applicants must have a high school diploma or GED, be 18 years or older, and have knowledge of basic math and computer data entry, and possess excellent communication and interpersonal skills. Tuition and fees for the program cost $2,113. The pharmacy technician program at Ghandi Health Career Services is designed to prepare students for employment as a pharmacy technician. The 10-week program includes a total of 268 hours: 72 hours in the classroom, 36 hours in the lab (also includes 5 hours of CPR training), and 160 hours at an external pharmacy site. Students attend the daytime classes three days a week on Monday, Wednesday, and Friday from 8:30 am to 2:30 pm. The pharmacy externship occurs during the final four weeks of the program. Students must attend 90% or more of the classroom sessions and 100% of the clinical portion and earn a passing score of 80% to complete the program. Graduates receive a certificate of completion at the conclusion of the program. Tuition costs $1,700 and does not include the cost of the textbook ($70). Registration costs $50. The pharmacy technician program at Fortis College trains students so they acquire the skills and demonstrate the competence to support the pharmacy operations in a retail, hospital, or home health setting. Students learn how to prepare prescribed medication for patients, stock shelves, and perform other duties under the direction of a pharmacist. Course topics include computer software applications, microbiology, drug classification, foundations of clinical pharmacology, drug preparation, drug therapy and administration of medications, IV solutions preparation, body systems, and a pharmacy technician externship. Students earn 15 credit hours at the program’s conclusion. Classes meet 20 hours a week – Monday through Thursday from 9 am to 2 pm. An evening schedule is also available. Class times are 6 pm to 1:30 pm Monday through Thursday. All students must complete 160 hours at an external pharmacy site. The school will administer the Maryland Board of Pharmacy exam onsite during the program, and graduates will receive certification at the end of the program. They can also opt to the PTCB exam. The MBP exam is included in the cost of tuition. Tuition costs $14,929. Books and supplies are an additional $672. Anne Arundel Community College’s Pharmacy Technician program is an affordable and top-notch program that prepares students for entry-level employment as an assistant to a pharmacist. The curriculum combines classroom lectures with practical training to support students’ transition to the fast-paced pharmacy setting. The program is accredited by the ASHP and ACPE and approved by the MBP. Students learn how to use written and oral communication in the workplace, assist the pharmacist in the monitoring of drug therapy, perform pharmacy functions, maintain patient confidentiality, use pharmacy terminology, and practice ethically with the guidelines of state laws. Course topics include human body structure and function, computing and information technology, medical terminology, introduction to pharmacy and health care system, pharmacy calculations, pharmacy law and ethics, hospital pharmacy practice, community pharmacy practice, pharmacology, professional development, and pharmacy practicum. Graduates earn 33 credits at the conclusion of the program and are eligible to sit the PTCB exam. Tuition costs $4,213. Books and supplies are an additional $1,718.